Attention 2020 Travelers! Enrollments received by May 15 get a $175 discount. Accommodations in centrally-located three-star or four-star hotels. Rooming on a triple basis. Double rooms: $200 per person. Round-trip transportation on scheduled airline. 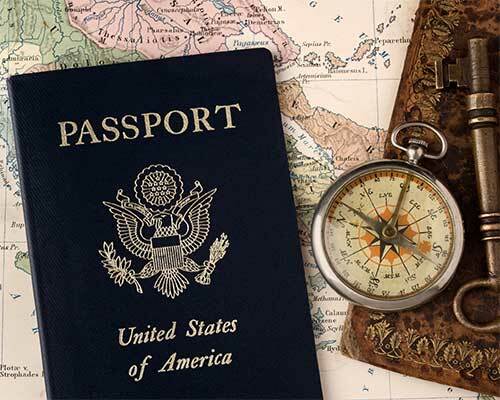 Services of a specially-trained passports Tour Director throughout. Entrances and activities as noted on itinerary. passports provides and pays for a Post Departure Travel Protection Plan that includes coverage for Trip Interruption, Trip Delay, Baggage Loss or Delay, Medical Expense and Evacuation and more. "Fasten your seat belts, ladies and gentlemen; we're now first in line for departure." A meal and a movie later the sky is orange off the left side, and it's Ireland that looms below. Begorra! Settle in, relax and get ready to discover a fascinating city, the hometown of many distinguished writers such as William Butler Yeats, Jonathan Swift, James Joyce, George Bernard Shaw, Oscar Wilde, Bram Stoker (author of Dracula), and Samuel Beckett. 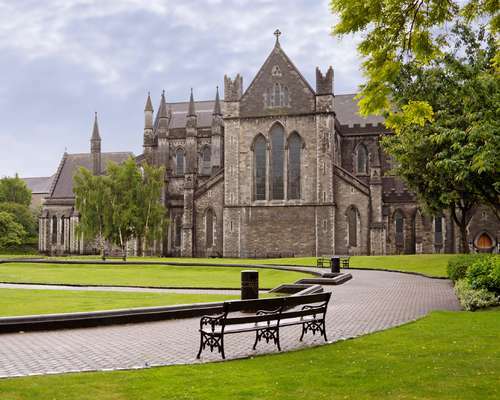 A city tour highlights landmarks such as Dublin Castle, Ha'penny Bridge, Christ Church Cathedral, Georgian squares and the Dublin Spire, built to celebrate the new millennium and hailed as the world's tallest sculpture at nearly 400 feet. Of course, you'll see the General Post Office on O'Connell Street, which became the headquarters of the rebels in the Easter Uprising of 1916. From its steps, Patrick Pearse announced the establishment of a republic. See how the building still bears scars from the fighting. 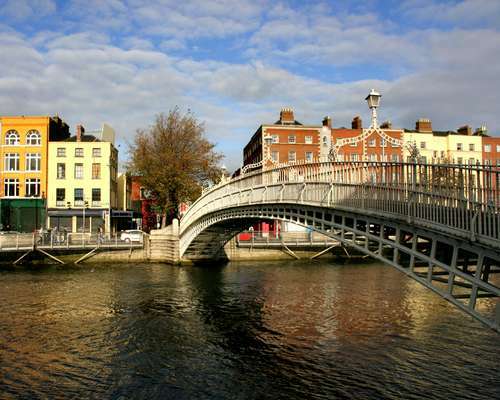 A half-day local guide, well-educated and specially-trained on the history and culture of Dublin, will accompany you today. Visit Ireland's largest church, founded in 1191 near the well where, according to tradition, St. Patrick baptized converts. See the grave of Jonathan Swift, Dean of the Cathedral and author of Gulliver's Travels, who was laid to rest in 1745. At the prestigious Protestant college established by Queen Elizabeth I in 1592, you will view the Old Library and its best known treasure, the medieval Book of Kells. Take advantage of the free admission policy at the Archaeology and History branch of the National Museum of Ireland to view an extensive collection that ranges from 7000 BC to the late medieval period. Priceless items include the Tara Brooch, the Cross of Cong and Celtic artifacts made of gold, silver and glassware. Explore a fashionable district as you follow cobbled streets dating back to Dublin's medieval city. The residence of Sir William Temple was a landmark in the 17th century, as was O'Neal's Music Hall in the 18th century, when it hosted the first performance of Handel's Messiah (1742) . Nowadays, the Temple Bar is a lively neighborhood that is home to several cultural institutions as well as pubs and restaurants. Cross the pedestrian span officially known as the Liffey Bridge, which elegantly arches its way above the River Liffey. When it was built in 1816 to replace ferries, it cost a ha'penny at the toll booth to walk over to the other bank, same as the ferry fare. By 2001, some 27,000 people crossed this bridge daily (for free)! The remainder of the day is free to plan as you wish. Save time for a stroll along Grafton Street, a pedestrian-only shopping street that meanders between grand townhouses from College Green, near Trinity College, to Stephen's Green. According to a popular song " Grafton Street is a wonderland." Check it out! A short flight takes you over the Irish Sea to Edinburgh, called the "Athens of the North" because of its rich literary and academic life. 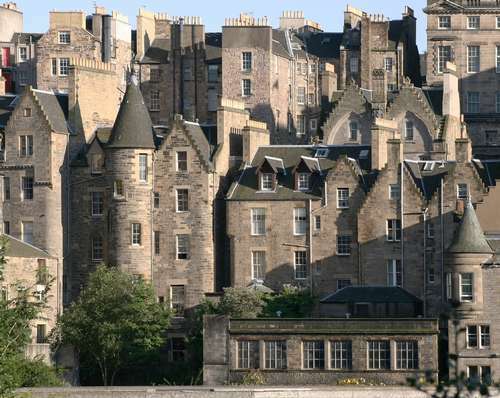 Enjoy a coach tour along the ancient Royal Mile, through the narrow alleys of the city's medieval Old Town and into the 18th-century New Town. See the extinct volcano, Arthur's Seat, which looms over the city. A half-day local guide, well-educated and specially-trained on the history and culture of Edinburgh, will accompany your group. Visit the fortress which defines Edinburgh's skyline from its high-perched location on the granite core of an extinct volcano. 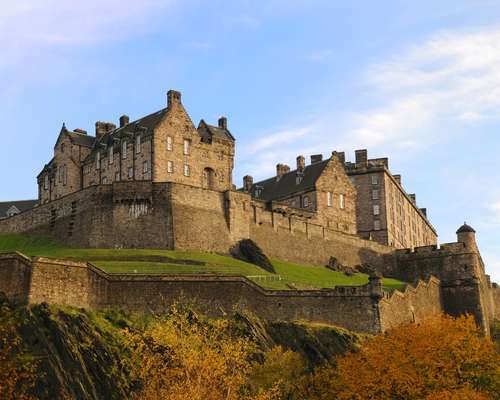 This castle shelters the Scottish Crown and Regalia, and the Stone of Destiny, returned to Scotland in 1996 after a 700-year stay at Westminster Abbey. Within its walls stand several buildings, including the Palace where Mary, Queen of Scots, gave birth to King James I of England in 1566 and St. Margaret's Chapel, built in 1130 to honor the pious wife of King Malcolm III. If H. M. Queen Elizabeth is not in residence, you will visit the Palace of Holyroodhouse, the monarch's official residence in Scotland. This evening is free to plan as you wish. Plan your free time or consider an optional excursion. You may want to visit the 5-star attraction located near the Parliament Building. Called Our Dynamic Earth, this museum is a great way to experience the forces of nature that created our planet ever since the Big Bang (which you can experience there!). Attractions include a 360-degree full-dome cinema, the 4D Adventure, and much more. Set out for the small town of Roslin, in the outskirts of Edinburgh, which has two claims to fame: its unique Chapel and the National Institute of Bioscience where the first cloned mammal, Dolly the sheep, was born in 1996. Enter the enigmatic sanctuary that figures prominently in Dan Brown's 2003 best-seller, The Da Vinci Code, and the 2006 blockbuster film inspired by the novel. Officially called the Collegiate Church of St. Matthew, the chapel dates back to 1446 and is regarded as an outstanding example of stone carving. Mysteries and legends represented in its stones attract a large number of visitors since the site has been linked to the Holy Grail, the Holyrood relic, buried treasures, ley lines, earth energy, medieval Knights Templar, Freemasonry, and more! Most good things must come to an end. Your suitcase full of memorabilia and of photos ready to be processed, you'll arrive home later today, eager to share your discoveries with family and friends. Departure Date* Departure Date is required. Departure City* Departure City is required. Full Name* If you actually have no name, how could you possibly lead a tour to Europe? Email Address* This is not a valid Email address! Street Address Please enter your postal address. City, State and ZIP Please enter your postal address. Group Makeup Select... High School Students College Students Middle School Students Adults Other Mandatory! You must click the checkbox above! passports Educational Group Travel partners with teachers across the United States to provide high-quality educational travel experiences to their students. Educational tours visit destinations around the world - primarily France, Italy, England, Spain and Costa Rica - at low, guaranteed prices.